As is usual, the media and the left (typically the same thing), already declared victory for the Arab and Jewish leftist block since yesterday, we knew better and The Lighthouse commented on that throughout the day, here and on social media. The right wing camp has the victory I am confident, despite Gantz, and company (including the media) claiming victory for the last 15 hours (from before the polls even finished closing). His attempt at trying to get small parties to join him, in case he was the biggest single party, even if the right wing camp was larger. No matter… its in our hands, and he may not even get the distinction of the largest single party. If all place country before their ministerial seat, we should be fine. What remains to be seen is Zehut… not crossing the threshold???!! Foul play? They have no representatives in the polling places like the major parties. Hopefully it’s just more lousy exit polling (as in Trump exit polling, society not allowing people to feel comfortable expressing certain views) and wishful leftist news coverage. The soldier’s votes coming should only improve things. Zehut might surprise us yet. Truly incredible, that #Lieberman, #Bennett and #Zehut apparently are all hovering around 4 seats. If they are all 3.99, then we have the equivalent of 12 seats, over 1 million votes [more like about 500 thousand] in a tiny country of 8 million, thrown to the garbage. The leftists always whine about every vote counting and tout democracy… but always support raising these thresholds. At least Meretz has shrunk to the point it will be in danger soon from this same arbitrary absurdity. What should be tethering on the uneventful brink of between 11 and 12, instead can be a cataclysmic 0, 4-5 or the 12 only at best case. They sold that bill of goods to the public with some nonsense to be addressed a different time. One of the few positive attributes of a parliamentary system, and it is cancelled by these absurd threshold arbitrarinesses. A few more short hours and we will know the final counts, behatzlacha to Am Israel! A few things to note. First, only 64.65% of the votes have been counted. 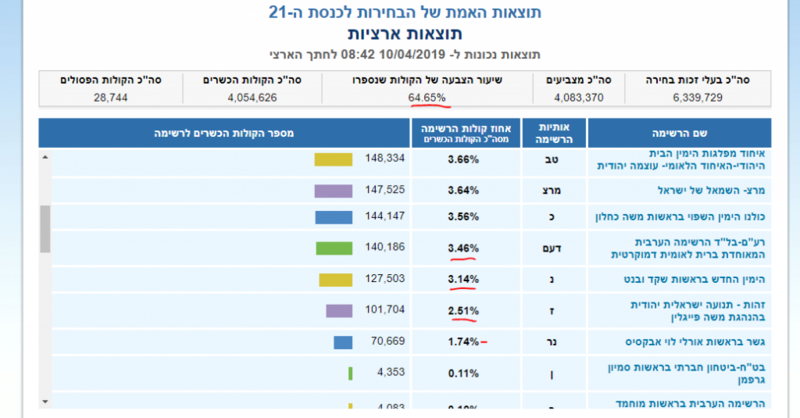 Meretz, the far left in Israeli politics and Balaad, an Arab party are barely over the threshold (at 3.64% and 3.46% respectively) but luckily for them and unluckily for Israel, above they are and so can count on their 4 seats each for now. The left’s only sacrifice to this absurd and newly raised threshold is Gesher, with 1.74%, and little over 70 thousand votes thus far. 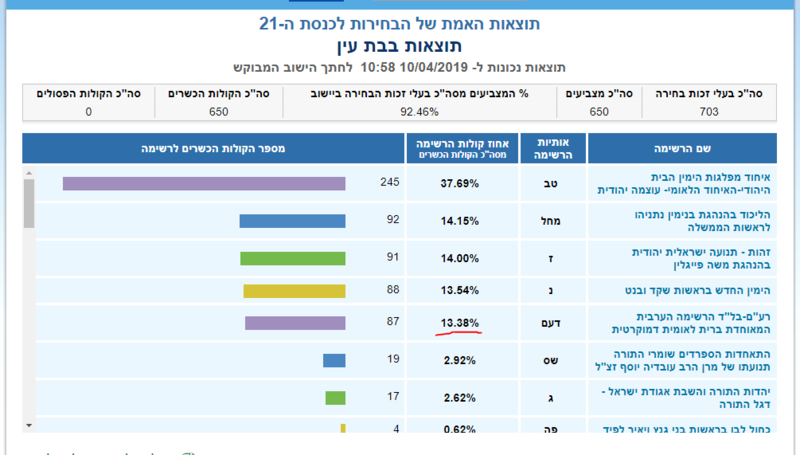 Bennett’s New Right is just barely below, at 3.14%, meaning that he either won’t be in the Knesset at all, or just might pull it off and have seats (changing the overall result to a significant right wing camp victory). Most sadly of course thus far, is Moshe Feiglin’s Zehut party at 2.51% at small but significant distance from the threshold. Ironically, many of his would be supporters who feared the unknown too much opted to vote for Kahlon and Kulanu who thus far is also barely above at 3.56%. Zehut’s drop is apparently due to the fear others succeeded in creating that a vote for Zehut would endanger a right wing camp victory (where nothing could be further from the truth). Tried to dispel that before and during the election. That aside, the point being here that the results of the elections, can vary dramatically and totally from the actual vote counts, due to completely arbitrary ever changing threshold rules applied by the larger parties. 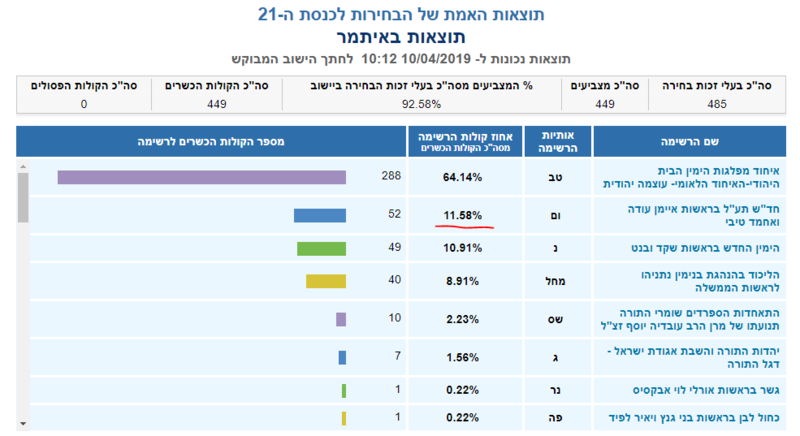 While keeping the overall percentages nearly constant, you could have had a right wing landslide with Zehut and Bennet crossing the threshold and Meretz and Balaad not crossing it (a 16 vote swing in Knesset terms from left to right), or the vice versa. It must be understood, that this is a representational vote for a parliament, not a single chief executive such as a president. This is nothing like the electoral college or winner take all states. This has neither a legitimate reason for existing, nor the historical foundation, nor is it enshrined in a constitution. This is a purely undemocratic and illogical arbitrary bar set up by larger parties to stop smaller (ie right wing) parties. There is nothing wrong with a party having 3 seats, nor 2 or 1 for that matter. The natural threshold set up by the founders of Israel is of course ONE… since you can’t have a half a Knesset member and a party that cannot win one seat will not be represented. But what is wrong with 3? Obviously, if this be the system from now on, joined lists and parties are of strategic importance, and the voter cannot have the luxury of voting for a party that closely matches his or her values.. but must be content with conflicting joined “mini coalition” parties… but here we are. In terms of the results, keep in mind they are not final or known yet. 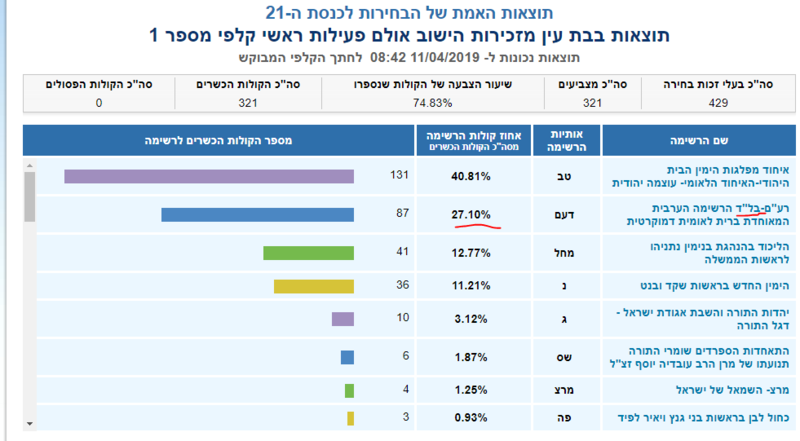 With about 35% of the votes yet to be counted, and the late coming army votes, Bennett actually has a decent chance of making it over the threshold, and Balaad has a decent chance of dropping under it. This alone would make the total results completely different in their implications. A true shift of the right in the makeup of the Knesset as a whole. And given a small small miracle, Zehut just might collect enough votes to swing it as well. 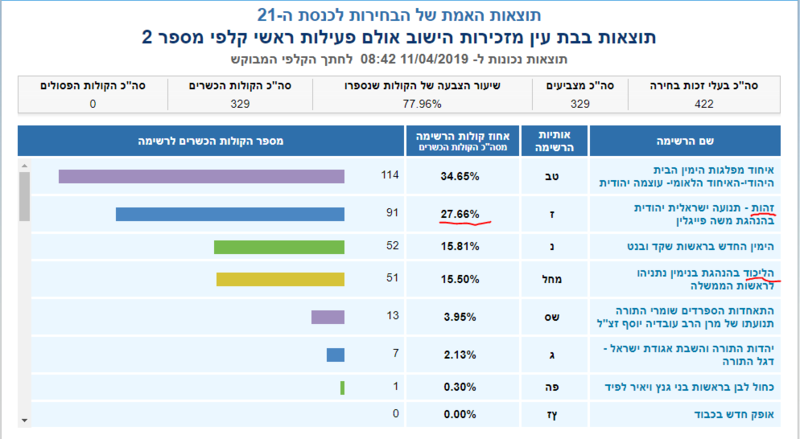 So far the leftists have been lucky with this arbitrary 3.25% minimum on parliamentary representation, and while Meretz seems to have garnered their 4 seats this time, I would not be so sure for next time. The parliamentary system in Israel has huge drawbacks, especially for a country in a strategic conflict with its neighbors, and I have discussed them before (such as in this article about Bennett and popcorn, and here in the “Background to the Election” section of this 2013 Voter Guide), but one of the very few upsides to it is the ability for many parties of all shapes and sizes to have proportional representation in the Knesset. If we had some sense, we would enjoy the fruits of that benefit and get rid of these thresholds. Some irregularities in the official results as they come in. 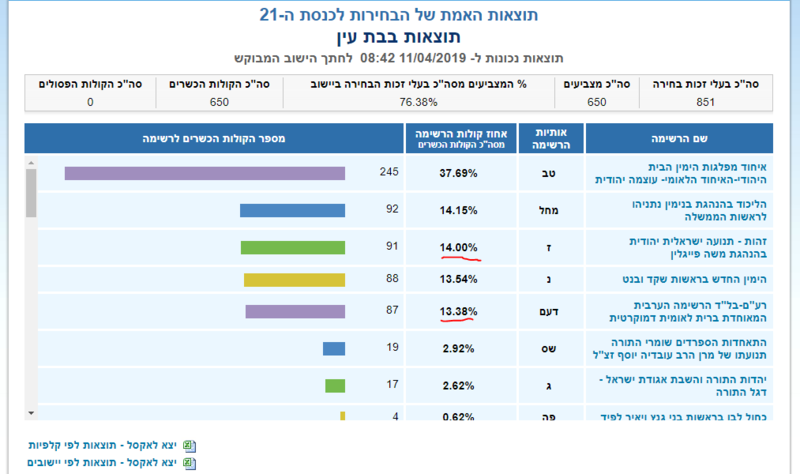 Certain Jewish settlements in Judea, which are home of course to right wing voters and no Arabs whatsoever are reporting no or low Zehut votes and large Arab party votes. Here is Itamar and Bet Ayn as examples. Translated to the nationwide effect this would be massive, and in cities where Arabs and Jews both live, this irregularity could not be detected. Final results are being slow, amid irregularities and fraud complaints which are being under-reported or not reported at all. Bennett’s party has crawled up closer to the threshold line, as I expected, but it is still too early to tell for certain. Zehut has gained some ground but it is still further off (another 20,000 votes or so less than Bennett’s party). Here is a more specific breakdown by polling station of the above issue to represent what has taken place nationwide against Zehut. Makes perfect sense. The Likud is now in 4th place, with the three parties right of them above them. Zehut is a strong number two, only slightly below the National Union with 27.66%. The Arab party of course has 0 votes here. The situation, within the same small town (village really), is completely reversed. Zehut is completely absent from the results, not one vote.. and Balad, the Arab party holds the strong second place position also nearly exactly at the same number (as Zehut in the previous polling station) at 27.10%. So when we look at the result as a whole we get an average of this, but by seeing the results per voting station, it cannot be clearer. The votes for Zehut in Voting Station 1 were erroneous or fraudulently given over to the Arab party, in one of the most conservative and Jewish areas of the country, with a non existent population of Arabs. Did Arab villages on the other hand report votes for Zehut in the second and third place rankings magically? Of course not, they reported voted for the Arab parties and the leftist Jewish parties to a lesser extent (they share goals, giving them land), in numbers often greater than the total registered citizens allowed to vote in those stations. This is a small example of the many that are being reported across Israel, including some disturbing video. It can be readily seen in areas and towns of homogeneous population (ie no Jews or no Arabs for example), but nearly impossible to detect in all the large cities and urban areas. At least simply by the results (other than the fact that in the case of Zehut, they are half of the expected results based on previous polls). Polls can easily be off and often are.. but most often the other way in recent years (results more right wing than polls expect, not less), and they are off by a bit, which can often be significant, but not by 50%. Moshe Feiglin unfortunately, as man of ideas, focused on expressing his ideas to the Israeli public in the campaign, and then trusted that the system would faithfully register his support. But the ground game in this dirty business is everything. From encouraging people to actually go vote, to (in Israel at least) having people outside the station encouraging and convincing people at the last minute, and perhaps most importantly having observers at all stations to ensure there is no fraud. Feiglin’s ground game as a new and small party was small to non-existent, and the “expert” tricksters carried him and his party away.